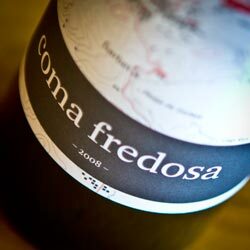 Hugas de Batlle produces this “Coma Fredosa” wine in Colera, which is a small, coastal village in the far, Northeastern region of Catalonia, Spain. Clocking in with a rather mighty 14.5% alcohol, this coolly-labeled bottle (it has a topographical map of the region) is 100% Garnatxa and spends 12 months in French oak. The nose is full of forest fruits with a light oakiness that can dip in to blackberry aromas at times. The body is thick and plush with a slightly oaky finish that’s quite clean. As the body is rather meaty with goods tannins and well-balanced acidity, it can easily stand up to hearty meats such as steak and lamb.